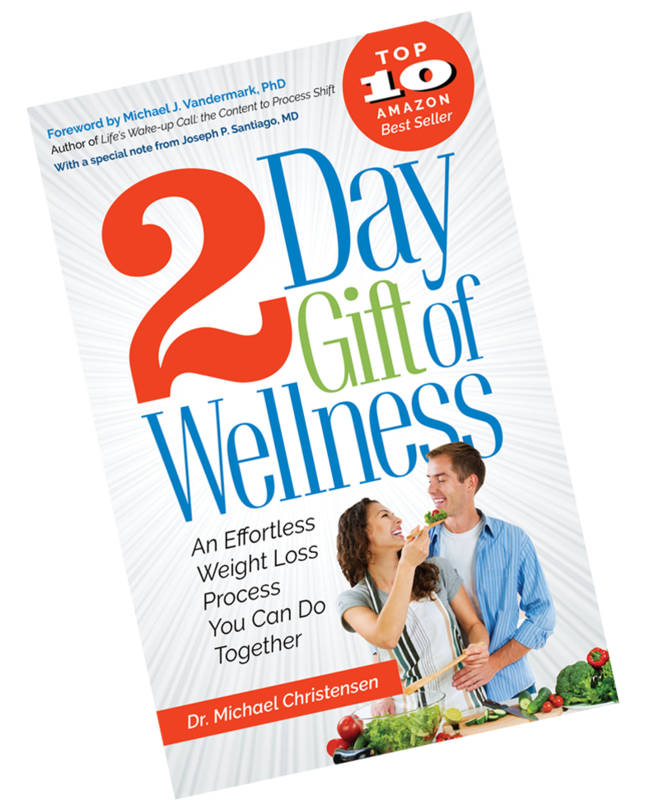 Get two free chapters of the 2 Day Gift of Wellness, and ongoing tips on how to lose weight as a by-product of wellness. Your gifts & blog posts are on the way. Check your email! How often have you lost weight, only to regain it and pack on even more weight than before? 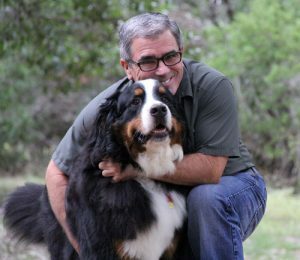 I’m Dr. Michael Christensen, and like you, I’ve been on the diet roller coaster most of my life. While I was never obese, I was always a little heavier than I should be. I’m an international airline pilot, so I can’t be overweight. In the past, before my physicals, I’d manage to lose enough weight to squeak below the maximum weight allowed. But two weeks later I’d be back up again with an added 5 pounds. Even worse, over the years I watched several close friends and family members go through painful weight-loss surgery. They did lose the weight, but they gained it all back within a year or so. What a traumatic experience. I don’t want that to happen to you. That’s why I wrote this book. — Debra Thomas, INHC, Author of What Did I Eat? Stop food reactions and find the right foods for you. The 2 Day Gift of Wellness is not a diet book. In fact, I coined the phrase the UdP ™, or Ultimate diet Process (with a small “d”) because it’s not a diet at all. It’s a lifestyle that promotes health, with weight loss as a by-product. And it’s based on what the science says, not on the latest fad diets popularized in the media. If you’ve read this far, you’ve mostly likely been on at least one diet that failed. Probably many more. The diet industry’s dirty secret is that most diets are not sustainable. But the $671 billion a year global weight loss industry isn’t about to tell you that! They make their money selling you one diet after another. 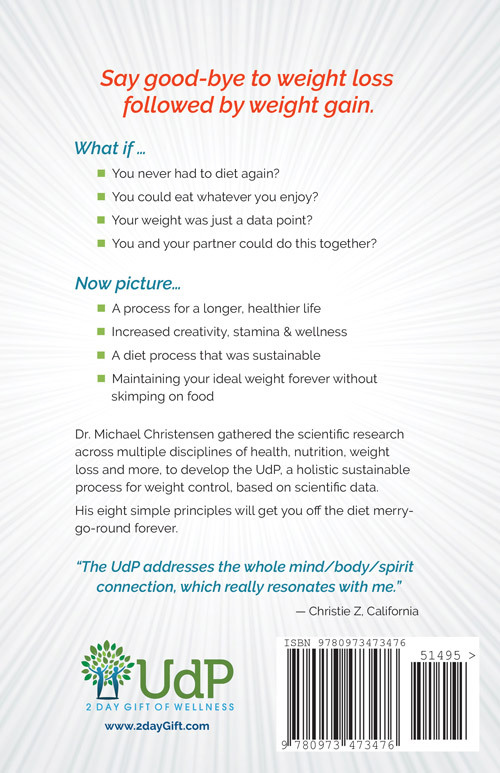 Here’s the truth: if the first diet worked, why would you need a new one? Most diets work in the short run because they are based on reducing the amount you eat. You lose weight – temporarily. But you can’t keep it up, and sooner or later you slip back into your old habits. Then, BAM! The weight comes back with a vengeance. Wellness, with weight loss as a happy side-effect! Most diets tell you what foods to eat and what to avoid. They also restrict the amount you eat by counting calories or points. 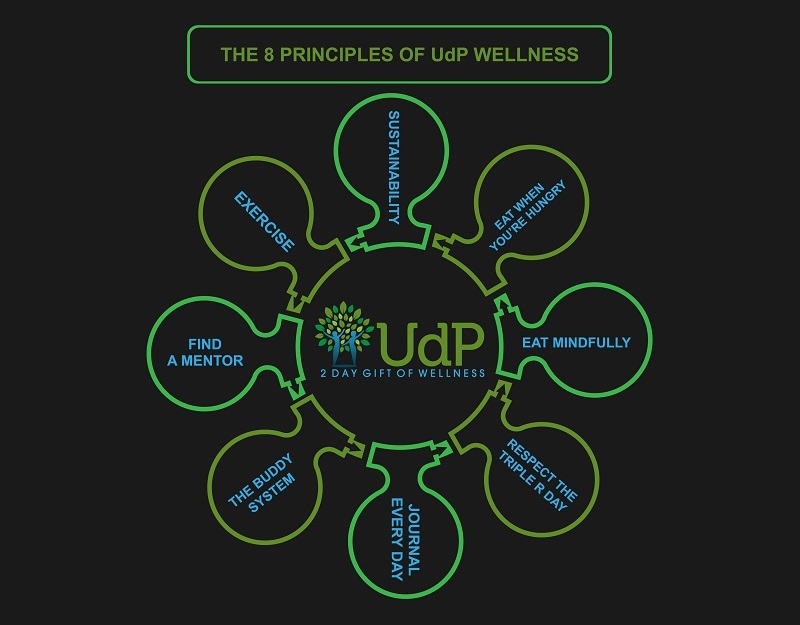 The UdP works on the level of your conscious and unconscious brain. When you try to fight your unconscious brain by reducing your calories, you’ll lose weight in the short run, but your body will win the war soon or later. Are you willing to give yourself the 2 day gift of wellness? The 2 Day Gift of Wellness is based on 8 principles of wellness. Each principle is important on its own, but the strength comes in combining them to make up the UdP. 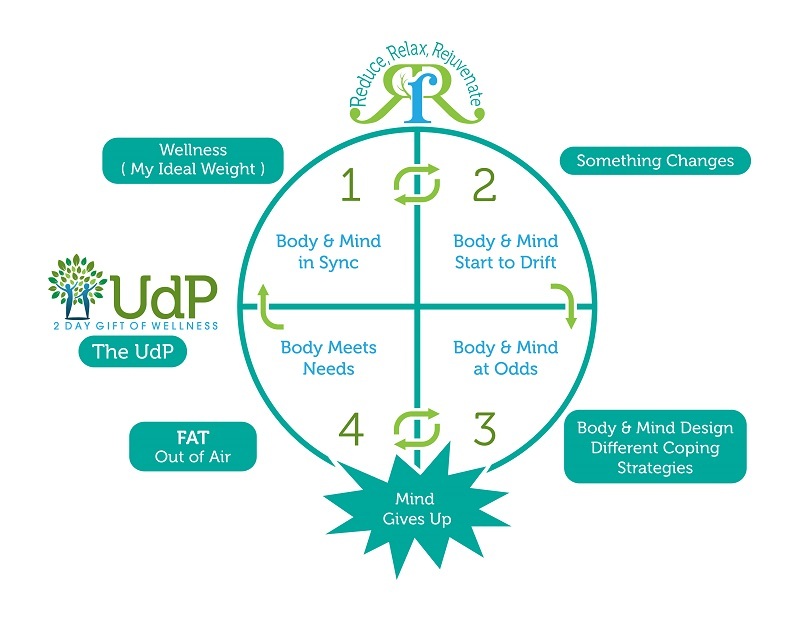 The heart of the UdP system is the Triple R day: two days a week that you take for yourself to relax and reduce stress. Reducing stress is vital to rejuvenating, as well as to losing weight, and maintaining your ideal weight once you reach it. And no, there is no requirement to eat certain foods, or eliminate other foods from your life. When you learn the process of the UdP, you can eat whatever foods you enjoy. Not exactly like the other diets you’ve tried, is it? So what will you discover in the 2 Day Gift of Wellness? Why “eat less, move more” doesn’t work, and what does instead. Page 26. A framework for healthy habits that are sustainable and give you results. Page 30. The truth about exercise: does it help you lose weight? Page 101. How a two-time cancer survivor lost weight after 20 years of failed weight loss efforts. Page 43. How to get your mind and body to work together so your unconscious brain no longer sabotages your conscious efforts to lose weight. Page 24. How to tell the difference between “feeling hungry” and “being hungry.” Page 50. Why breakfast is not the most important meal of the day, and what is more important. Page 51. How to reduce stress and boost your wellness using the Triple R day at home, at work and even while travelling internationally. Page 59. The mind/body/spirit connection to better health, and why missing even one component will sabotage your weight loss. Page 77. A sneak peek at one woman’s journal: what she ate, how she slept, and how she felt each day. You’ll relate to her trials and triumphs, which may be similar to your own. Page 82. The power of working with buddies and mentors to optimize your success. Page 90. Your questions answered! From what to eat, to seeing your doctor, all your questions are answered here. Page 125. Travelling? Get the best tips from an international airline pilot who lost 25 pounds while traversing multiple countries and continents. (Most people gain weight while travelling). Page 112. How Christie Z knew she had found the solution to losing weight and gaining health. Page 169. Triple R day sample menus, journal samples, and much more! "Feeling more grounded and at peace"
I noticed I was feeling more grounded and peaceful despite some very stressful things in my life. "Weight is falling off without effort, even on vacation"
Weight is literally falling off without much effort. I was surprised at how easy the process is. I lost almost 4 pounds the 1st week of vacation, which is unheard of! "Long–term sustainable, and no more heartburn!" I haven’t had any heartburn since I started [the UdP]. My weight is dropping at a steady pace and I lost almost 20 lbs. in 6 weeks. This process is sustainable long term. "No need for Spanx under a wedding dress"
Trying on wedding dresses was fun! The gal helping me said I didn’t need to wear the Spanx I had on. "Refreshing sleep and more energy"
After my first Triple R day of the week, I finally slept well and woke up feeling rested for the first time in a long time. © Copyright 2016 2daygift.com. All Rights Reserved.